This evening the main dome of our wood fired bread oven was completed. We have been racing against the cold weather that has been forecast and unfortunately it has come a day early. It looks like we could have temperatures below -5°C for the next month or longer. In these temperatures the water content of the mortar will freeze which would not be good for the brickwork. In order to be able to continue in these temperatures, the dome needs to be finished and am electric heater sealed inside, this will keep the brickwork above freezing, and hopefully warm enough for the mortar to harden. I have been working flat out in the evenings in attempt to finish the main dome. You can see here the completed main dome. 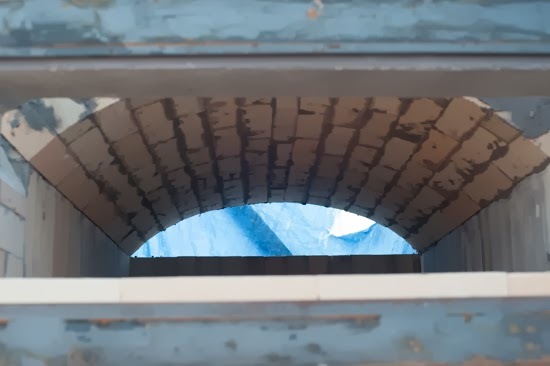 The larger gaps in brickwork have been filled with a mix based on the the refractory mortar with a courser aggregate added. This makes it more suitable for filling larger gaps and will help it dry out. I would have liked to leave the form-work for a couple of days, but a heater is needed under the arch, so the supports had to come out. 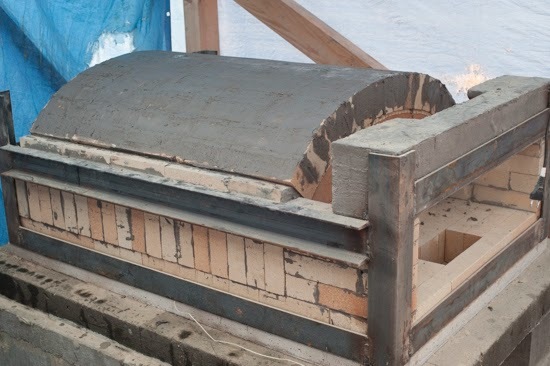 Fortunately the form-work came out without bringing all the brickwork down leaving the first glimpse of what the inside of the oven will look like. A little more brickwork still needs finishing before the oven can be wrapped up in insulation, so I am still working flat out. I will update with further progress once I can take some more pictures.